At the first sight of a sweater, we usually have the first visual impression on its design, then its hand feeling, and last its workmanship. The important parameter to evaluate a sweater is what we say – tension. 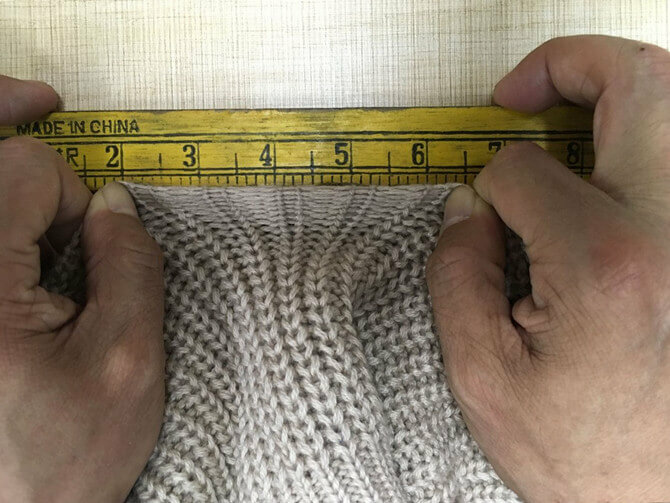 TENSION means the degree of tightness of knit texture; before writing artwork, the technician usually requires to knit a piece of fabric (30x30cm) to determine the square number/tension. -The measuring tension method is to strain the fabric (extend it as far as it can be) to a certain needle (i.e. horizontal pull, vertical to the fabric) or to a certain course (i.e. straight pull, along the direction of the fabric), to see the length it can reach. -Taking jersey stitch as an example: horizontal pull 10 needles of 12gg jersey knit down is 1 inch 4 points (i.e. 1-4/8 inch), we call this knit down tension 1 inch 4 points. -The methods of pulling RIB are different. In general, we pull a few ribs (a rib comprises face and back). For example of 2×2 rib, pulling tension of 10 needles will possibly have two results due to different ways of pulling by different people. One is to pull 10 needles of face and back each. The other method is to pull 10 needles of face and 9 needles of back. Therefore, special attention is needed to avoid mistakes. -Weight: Under the normal circumstances, the tighter the tension is, the heavier the sweater will be. But the special circumstances are different. -Hand feeling: If the tension is tight, then it feels hard and a little thick; the Chinese local cashmere sweater market prefers those with tight tension; 12gg jersey sweater tension is usually made to 1 inch 4 points. But European and American customers prefer fluffier and lighter ones, which is made to 1 inch 6 points or so. -Stabilization: Normal yarn counts do common tension, the empirical way can make sweater shaped well. For example, 2/30NM CASHWOOL yarn to make 12gg sweater, the commonly tension is 1 inch 4 points, the sweater will be neat and clean, will not twist. -Shrinkage: the tighter the tension is, the less shrinkage the sweater will be. – Designer’s idea: style designs should be fully considered, some styles require very loose effect, then need to choose the loose tension to make. -Yarn: different yarns have different quality, different counts and use different ends, which causing tension is changing correspondingly. -Gauge: different gauge has its matching tension. -Styles: sometimes customers request to do the effect of fluffy, and then need to make a loose tension. -Operability: it is needed to knit some swatches on machine to find the best tension. It must be good for bulk production, too loose or too tight tension is not conducive to the mass production, which should be paid special attention to. In summary, when we develop a new style, we must understand thoroughly the designer’s idea, knit some swatches for customer review and choose. As to the common yarns and styles, empirical method can be used to write artwork directly.